Martina Navratilova was born today, October 18, in 1956. 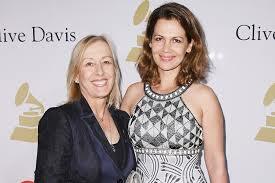 She is a former Czechoslovak and later American tennis player and coach. In 2005, Tennis magazine selected her as the greatest female tennis player for the years 1965 through 2005 and she is considered one of the best, if not the best, female tennis players of all time. She won 18 Grand Slam singles titles, 31 major women's doubles titles (an all-time record), and 10 major mixed doubles titles, combined marking the open-era record for the most number of Grand Slam titles won by one player, male or female. She reached the Wimbledon singles final 12 times, including for nine consecutive years from 1982 through 1990, and won the women's singles title at Wimbledon a record nine times. Navratilova holds the records for most singles (167) and doubles titles (177) in the open era. Her record as No.1 in singles (1982–86) remains the most dominant in professional tennis to date. Over five consecutive seasons, she won 428 out of 442 singles matches, averaging fewer than 3 losses per year to 87 wins, for a sustained winning percentage of 96.8%. She also recorded the longest winning streak in the open era (74 consecutive matches) as well as three out of the six longest winning streaks in history. In women's doubles, Navratilova and Pam Shriver had one of the most successful partnerships in women's doubles and won 109 consecutive matches including all four major titles, the doubles Grand Slam, in 1984. The pair set an all-time record of 79 titles together and tied the record set by Louise Brough Clapp and Margaret Osborne duPont of 20 major women's doubles titles as a team. Originally from Czechoslovakia, she was stripped of her citizenship when, in 1975 at age 18, she asked the United States for political asylum and was granted temporary residency. At the time, Navratilova was told by the Czechoslovak Sports Federation that she was becoming too Americanized, and she should go back to school and make tennis secondary. 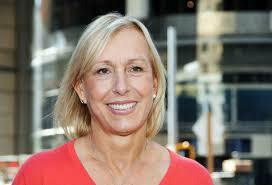 Navratilova became a US citizen in 1981. In 1981, shortly after becoming a United States citizen, Navratilova gave an interview to New York Daily News sports reporter Steve Goldstein, coming out as bisexual and revealing that she had a sexual relationship with Rita Mae Brown. She asked the reporter not to publish the article until she was ready to come out publicly. However, the New York Daily News published the article on July 30, 1981. Navratilova has since identified herself as a lesbian. From 1984 to 1991, Navratilova had a long-term relationship with Judy Nelson, whom she met at a tournament in Fort Worth in 1982. Their split in 1991 included a much-publicized legal wrangle. She really has been a model of poise and dignity for decades, shaming so many other spoilt kids of the past and present in the sport. One still hears occasional barbs shot at her for no other reason than getting an easy laugh at her through her sexuality (at least it still happens here - and elsewhere too I'm sure) but if she's aware of them she rides them out to perfection by not reacting. I bet she'd be a wonderful friend to have.